Grab is a taxi app whereby you can call for a taxi using an app on your smartphone. It’s extremely popular in Singapore and Southeast Asia. 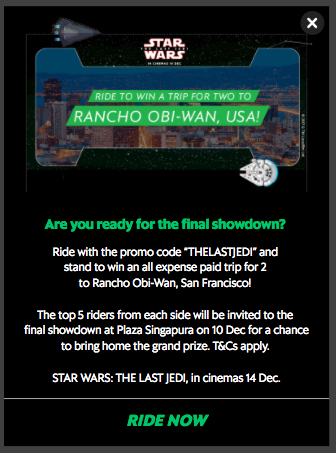 We ran a promotion with Grab and the Walt Disney Company (Singapore) to offer five different trips for Star Wars: The Last Jedi with trips to Rancho Obi-Wan in San Francisco.